When in Manila check out the highly raved about Vask Modern Tapas Bar and Gastronomic Cuisine located at 39th Street 11th Avenue Clipp building Bonifacio Global City. Chef J. Luis Gonzales brings molecular gastronomy to traditional and modern Basque Tapas to the Philippines, one of the few restaurants that has a sous vide water bath machine. Vask’s soft opening was in April 2013 and the grand launch to follow with their Degustation Art Gallery. Vask is only open for dinner with two seatings at 6:30PM and 8:00PM. Make sure to reserve in advance as it is usually fully booked a week ahead. We highly recommend the Pulpo a la Gallega, Scallops and Black Ink Risotto, Huevos, Hongos y Cebolla, Lapu Lapu con Romesco y Puerros, Kurobuta Cheeks, Manitas y Callos a la Bizkaina con Chorizo. Bon Apetito! The kitchen closes at 10PM but the bar and outdoor patio is open ’till late and they serve wicked cocktails! 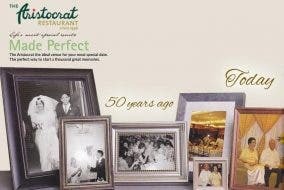 WIN GCs by Sharing Your Aristocrat Restaurant Ultimate Throwback Wedding Photos!